SIGN UP! for the newsletter for notification of Communication Dojo events. Price: low introductory prices - $40 per individual, $60 for each pair - Bring a friend!! Theme "Asking for what you want"
Contact us at sheryl@communicationdojo.com or (415) 694 8798 for more information. Cost: No one turned away for lack of funds. I request a contribution in the $80-$160 range for the whole 4-week series from those who can enjoy giving in that range. For others I request whatever amount will most encourage you to keep coming back! 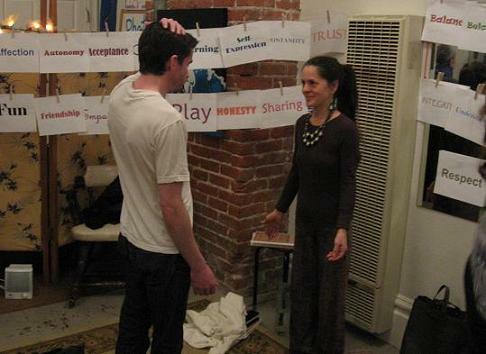 NEW TO NONVIOLENT COMMUNICATION? Reading Marshall Rosenberg's "Noviolent Communication - A Language of Life" will give you adequate preparation for the weekly group. Alternatively you can attend an intro class. Call Newt at 415.694.8798 to inquire about intro classes, and to get the exact location and dates of upcoming meetings. LISTEN to an interview with Newt Bailey from Alissa Kriteman's "Just for Women" show. "Over the course of four classes, you downloaded an enormous amount of information - oral and written. I feel full and nurtured and inspired to practice and live this." You will benefit from attending the Communication Dojo if you are looking for greater harmony and connection with your partner, or if you would like communication in your next relationship to be very different to your last one. The consciousness and skills you develop are equally applicable to family and workplace communication. When I ask people how to start an argument I always get lots of suggestions. Blame, criticism, judgment, demands, threats, unrequested advice giving, telling others that what they're saying is unimportant or wrong - the list continues. When I ask about communication difficulties that simply reduce enjoyment of life I get lots of suggestions too. Difficulty saying or hearing "No," reluctance asking for what you want, problems saying "Sorry," "Goodbye," or "I love you." And there are so many other areas where communication difficulties lead to annoyance, frustration, anger and other painful emotions: "We love each other but we bicker a lot and it's very frustrating" or "My bosses never ask my opinion even though I bring in more business than anyone else on the team" or "My brother seems to be angry all the time and I don't know how to talk to him." Classes consist of group instruction, demonstrations, games, and exercises in pairs and small groups. The Communication Dojo method is inspired by the teachings of Dr. Marshall Rosenberg, International Peacemaker and Founder of the "Center for Nonviolent Communication." You may have heard of his work under other names, includng "Authentic Communication," "Productive Communication," "Compassionate Communication," and, the name used or the Communication Dojo, "Connected Communication." Another source of inspiration for the Communication Dojo approach is the martial art aikido, sometimes called "the art of peace." Aikido is practiced in a space called a "dojo." Aikido practitioners learn to respond to attacking energy in such a way that no harm comes to themselves, or the attacker. At the Communication Dojo you will learn and practice a similar response to "verbal attack." Other similarities between an aikido dojo and the Communication Dojo is the use of practice in pairs -- simulating difficult communication in a safe environment so that you are able to respond peacefully and powerfully in the often chaotic and fast-moving circumstances of real life. I'm a mediator and communication coach, trained by John Kinyon, co-founder of the Bay Area Nonviolent Communication Center. I provide training on how to create exceptional workplace communication in organizations and companies, and also help couples, and individuals, who are experiencing conflict and communication difficulties at home. "I felt thrilled and challenged throughout your dojo, which could easily be called 'Nonviolent Communication in a Nutshell.' Over the course of four classes, you downloaded an enormous amount of information - oral and written. I feel full and nurtured and inspired to practice and live this. "I also think of your dojo as 'Nonviolent Communication For Dummies.' I found your presentations to be user-friendly, accessible and highly applicable to everyday life and relationships. "I thoroughly enjoyed our group and the connections I made through our buddy calls and in-class practice. "Your course definitely met my need for community, support, and education - and practicing a language that supports a more connected way of life. "Thanks for doing what you do." "I particularly enjoyed the opportunity to connect with other trainees outside of the Dojo, and to actually get to know people on a deeply personal level. I found people I'd like to become friends with, and with whom I could form business relationships. "Other relationships outside of the Dojo have absolutely been affected. I was engaged in a very challenging communication with someone a few days ago, and my ability to accurately reflect back this person's concerns and fears was much improved. I'm confident that his need to be heard was fully met -- and that feels good to me. I walked away from that conversation feeling surprised at my new capacity. It was like watching/being the strong, grounded, compassionate communicator I knew I could be. "I also learned how to set up opportunities for me to be listened to in a conversation. I've increased my ability to deliberately request listening from people that I might be in a triggered or challenging conversation with. "I enjoyed Newt's sense of humor. I believe that a much greater sense of community develops when humor is included in the learning process." "The benefits that I'm experiencing are that I'm feeling more connected to my friends and family because I'm giving them empathy. I'm also being really clear about asking for what I need and checking in with myself." "Overall, I thought the whole dojo was extraordinary!"